Welcome to your best choice for reliable, high quality, and fun commercial bouncers. A commercial bouncer at any location is a great way to provide hours of entertainment for all types of occasions, parties, indoor centers, fundraisers, and more! We have commercial bouncers of more than 100 different styles, colors, and options to choose from. With Commercial Bouncer, we provide a fast, convenient, and no hassle service where we put our customers first, along with a convenient and fast online checkout system. Our commercial bouncers are completely Americanized, designed and manufactured in So Cal, by Californians. All of our commercial bouncers come with a detailed instruction manual and safety plaque to educate customers, riders, and operators alike. Watch the video below to see how a commercial bouncer is made, then click over to our Sales or Rentals page for more information. Looking for a Commercial Bouncer for Rent? Bouncers are a great source of fun and joy for a wide range of ages. Young children as young as three or four years old can enjoy a bouncer, as well as, adults in their late fifties. A Commercial Bouncer provides a good amount of exercise and can put a bounce in the lives of people and events. These colorful creations put a smile on faces and leave a party with guests that are impacted with fun. There are a few things you should take into consideration before renting a bouncer for your event, visit our rent page for more information. 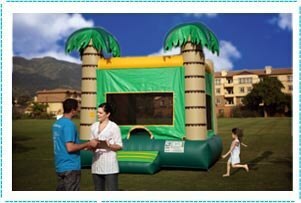 Commercial Bouncer © 2012 by Magic Jump Rentals Inc. The Discovery Channel show “Some Assembly Required” goes through how Magic Jump manufactures a commercial bouncer that will later be used by consumers world-wide. The show goes through the step-by-step process of manufacturing the vinyl, drawing up the 3D models for the commercial bouncer, to cutting the pieces and sewing them together for the final assembly. The manufacturing of a bouncer has evolved through the years with advances in technology, but this video details the general process of how a commercial bouncer is made. Once these bouncers are made, they are later shipped off to a rental company, indoor center, or client who uses it for their designated purpose, to deliver fun and add a bounce in peoples lives. Looking for high quality commercial bouncer? Look no further, we have the industry’s leading commercial bouncer manufacturer with a track record of highly durable, safe, and creative bouncers and inflatable games. According to Ion channel show “World’s Greatest”, Magic Jump is the best bouncer manufacturer in the industry today. 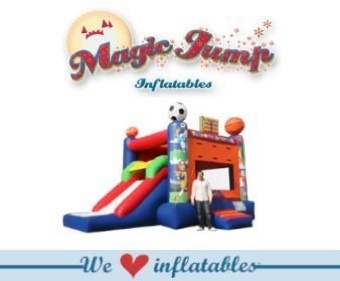 Magic Jump has been in business since 1996 and provides U.S. designed and manufactured commercial bouncers which are sold world-wide! Magic Jumps bouncers have been featured on shows, movies, and news stations, and have been trusted by hundreds of companies and thousands of consumers for its great quality of products and level of service.